As the new school year draws closer (or has already begun here in Kenya) parents gird their loins for the disassembling process of understanding their kids’ report cards. What should be a relatively simple snapshot is often ambiguous & hard to understand. That’s why I loved the article in the Globe & Mail that had this graphic. It’s clean. It’s highly visual. It’s colourful. It’s inviting. It’s easy to understand. It’s informative. As training & development professionals we can learn a lot from this example (whether or not you have kids running you ragged or not). 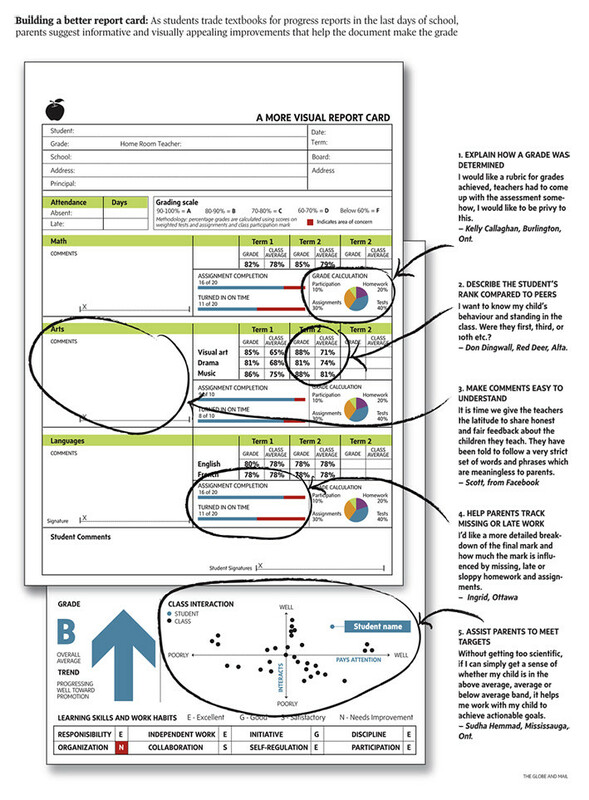 From training feedback forms to employee performance assessments to other types of assessment & evaluation how can we make them clean, visual, colourful, inviting, easy to understand & informative? Two tools I frequently use are comfight (for appealing visuals) & word clouds. One tool I’m starting to use is graphic facilitation. What about you? What can you do with the element of surprise? ‘Engage and develop every young person in the world’ – how about that for an audacious B.H.A.G.